The Turta da Nuschs, or Engadiner Nusstorte as it is known in German, is a caramelly, walnut filled tart from the canton of Graubünden. It's one of Graubünden's most popular cakes and, due to its long shelf life, it's often bought by tourists and brought home with them. But walnut trees are not native to Graubünden, so how did this cake become a regional classic? The history of the cake is linked to the Engadiner Zuckerbäcker. These were young bakers who fled poverty and military service in Graubünden to work in restaurants, cafés, and bakeries throughout Europe. From the late middle ages onward, the Zuckerbäcker made a name for themselves as hard and thrifty workers, and for Swiss quality in general. They opened bakeries and cafés as far afield as Madrid and St Petersburg. With their successes abroad, they were able to send money back to their valleys and support their families and the communities they had left behind. It was from these wandering bakers that the Turta da Nuschs originated. 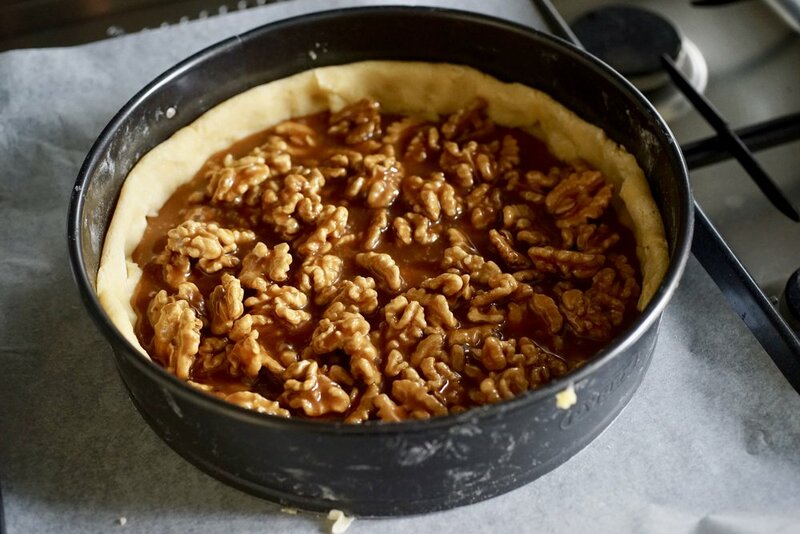 Although there are conflicting accounts, the most likely origin story is that the recipe was developed in the south of France, then brought back home by Zuckerbäcker from the Engadine valley (with some walnut trees in tow). Some of my family lives in Eastern Switzerland, and no trip to Chur is complete without a stop at Cafe Merz to pick up a Nusstorte (the second best Nusstorte in Switzerland, according to Kassensturz), but if you can't make it all the way to Graubünden, you can make your own Turta da Nuschs at home. In a large bowl, whisk together the flour, salt, and sugar. Cut the butter into the dough. In a separate dish, whisk the egg with water, then add this to the flour and stir lightly until you have a dough. Press this into a disc, wrap in plastic and store in the fridge for about 30 minutes. Preheat your oven to 200 C / 400 F / gas mark 6. In a large pot, heat the honey over medium heat. 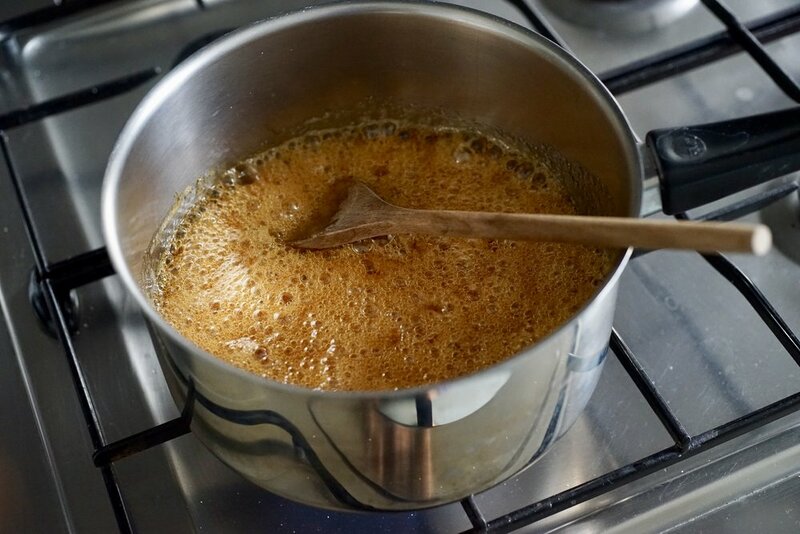 Add the sugar and let it dissolve and turn to a caramelly brown. Take the pot off the heat and carefully add the cream (watch out, it splutters! ), then stir in the walnuts and salt. Let this cool. You need a 26 cm / 10 inch springform pan. 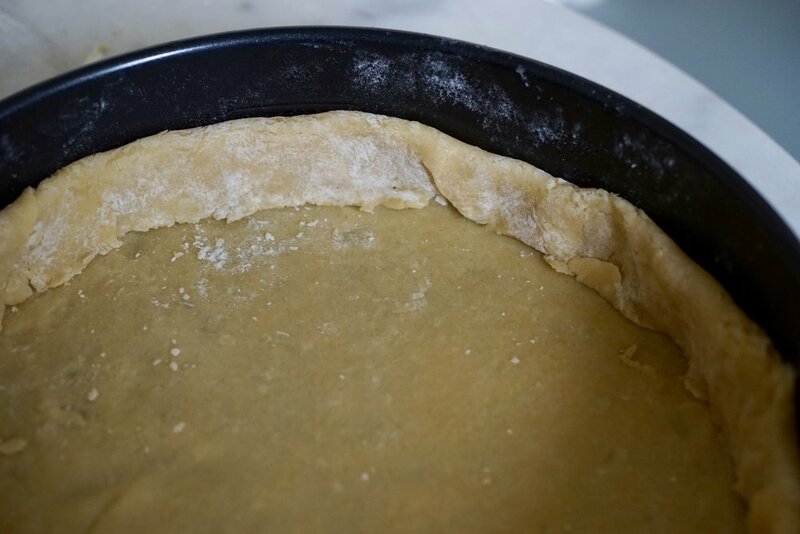 Roll out your dough, using about two thirds for the base and thick sides (about 3 cm/1 inch high). Fill with the cooled nut mixture. Use the remaining third of dough to roll out the top, then prick it all over with a fork. Lay it on top and press around the edge with a fork. Bake for about 45 minutes, or until the top is nicely browned. This tart keeps well. 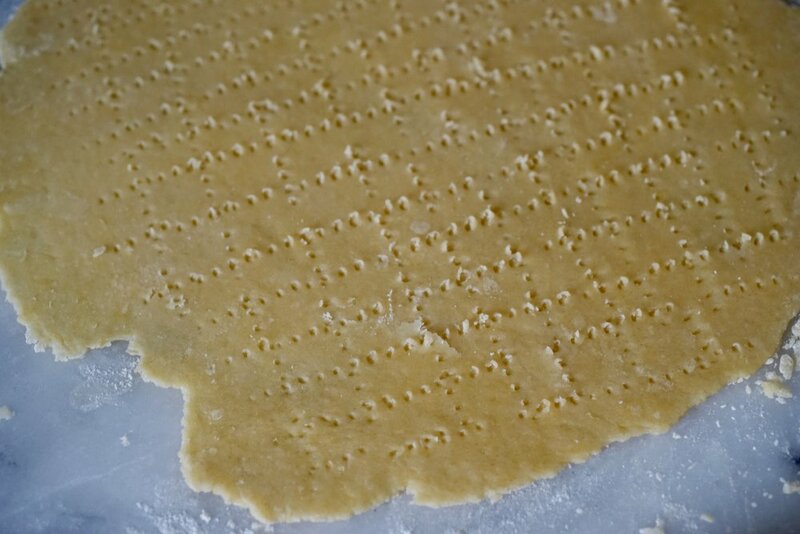 Cutting it is much easier the day after you bake it, and the flavour deepens over time.